The person who happily rocks up to the party and doesn’t bring a thing EVER. The person who will call and offload all their problems to you but is never available in your moment of need. The person who always wants to be picked up (even expects it) but never does the picking up. Or as I like to call them: The “One Way Street Human Being”. The first flavour is that of the Scarcity Taker. The Scarcity Taker simply believes that there isn’t enough to go around. They feel the need to take and hoard whatever they can get their hands on because they believe there is a finite supply on the planet. They will let you buy lunch because then they get to save their money (even if you have bought lunch the last five times). They might need their money for something else so they are not going to offer it or spend it if they don’t have to. The Scarcity Takers don’t ever view this as unfair or rude – they see it as sensible. They think there isn’t enough to go around so why spend when they don’t have to? You offered to buy the lunch, so they get to squirrel their cash away for another day. This is a win/win situation for them, but not for you. The second type of Taker is the Entitled Taker. The Entitled Taker genuinely believes that they have the right to take more than others. They will happily go to the pub with a group of people and let everyone else buy the wine for the table. Of course their glass will never be empty! There is wine on the table and they are entitled to drink as much as they want. The Entitled Taker does not even consider that there is anything wrong with this – they are entitled for God sake! The Entitled Taker often appears cocky and arrogant in their taking. There is no apology for their lack of contribution. They boldly grab at what they want (often without asking) and then will fire back strongly if anyone challenges them. The third kind of Taker is the Selfish Taker. The Selfish Taker genuinely struggles to think of anyone else’s needs. It is all about them! The Selfish Taker normally has a highly inflated sense of importance (which stems from poor self esteem) and therefore their needs and desires trump everyone else’s. Selfish Takers tend to have the quickest turnover of people in their lives because their overt self-focus gets boring very quickly. The Selfish Taker wants it their way every time. If it doesn’t go their way, they like to punish whoever was involved. They will fight back when challenged because they cannot see any other point of view and will normally be outraged at the suggestion that they are taking. 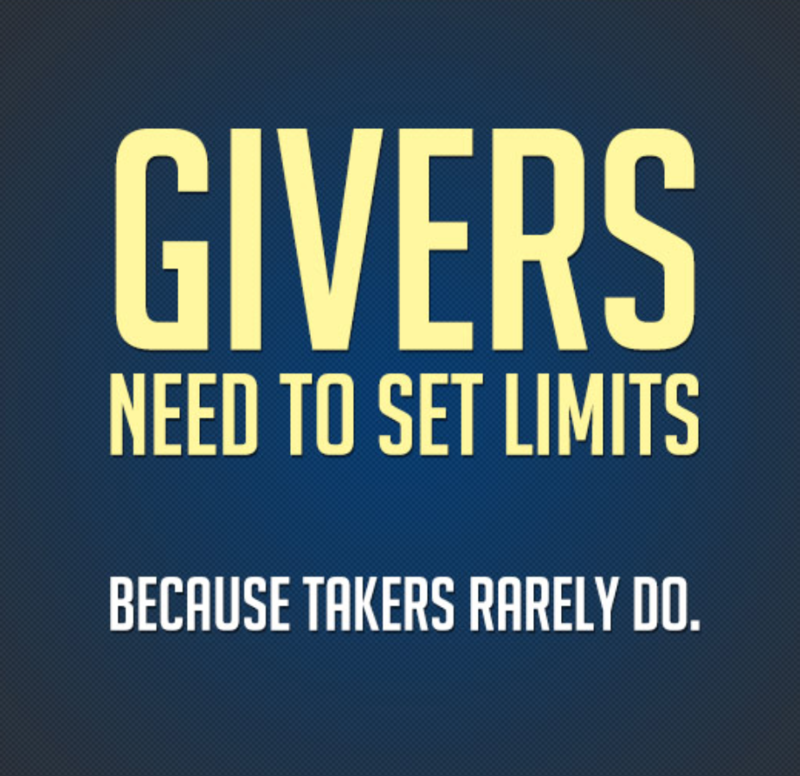 The fascinating thing about Takers is they attract Givers. Like night and day, man and woman, black and white, yin and yang – a taker needs a giver. Givers needs takers too. The Giver gets to feel important and valuable because they are meeting their need for contribution (underneath that they are really meeting their need for love, connection and significance) so for a while this is a symbiotic relationship. But there ALWAYS comes a point. The Giver realises that they are being used and the Taker starts to morph into a parasitic being – sucking the Giver dry with an ever growing thirst for more and more. This is normally where the story gets interesting! The Giver becomes agitated! Yet often they don’t want to speak up because confrontation is the last thing they want. The Giver has collected hundreds of examples of where they gave and the other person took. They are genuinely baffled at why the Taker cannot see this. The Taker should KNOW what they are doing; they should realise just how much the Giver is giving – it’s obvious isn’t it?? NO, IT IS NOT! You are dealing with a Taker. It’s time for you to put your big girl (or big boy) undies on and make some decisions! This doesn’t mean ending the friendship, although that is often what happens. It means drawing some lines in the sand, getting clear on your boundaries, and most of all it means finding a voice and speaking up. Saying “If you want to keep drinking the wine from the table, please go and buy some to add to it – otherwise stop drinking our wine”. I can hear the collective intake of breath from all the Givers as they read that: “I can’t say that!! That is so rude!”. But so is bagging them to everyone who will listen because you don’t have the courage to speak up! So is not valuing yourself enough to speak your truth! Every day we are teaching people how to treat us. The statements above are teaching the Taker that what they are doing is not okay. You have now made them accountable. By making them accountable they will think about their actions next time this situation occurs. You might have to call them on it five times, but you are speaking your truth and will feel SO much better for it in the long run. “Givers need to know when to stop giving because takers don’t know when to stop taking”. Never stop giving – it is definitely one of the most beautiful traits in human beings. Just make sure you are giving and not being used. I loved reading your blog. I am now going to reasses some relationships and start changing some boundaries in my life. Thanks for writing this.